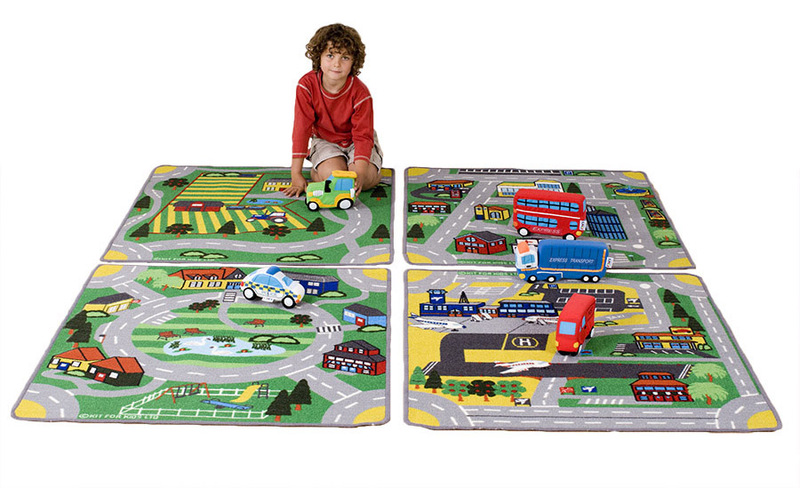 The Town & Country Road classroom rugs are a set of 4 carpets which cover road maps for town, village, country farm and airport themes. Designed for use in play areas within schools, pre-schools and nurseries. The four mats have been designed so they can be placed in any configuration next to each other with the roads on each mat lining up to make one large interactive network. They have been scaled for use with most children's toy model vehicles. The tightly woven durable tuf-loop is hard wearing and enables easy movement of children's toy vehicles. The tightly bound edges prevent fraying and the tuft strands meet heavy duty laboratory pull tests. Manufactured using robust soft textured twisted loop Nylon with a shorter pile which makes it easier to play on.